GKN Motorsport is the largest designer and manufacturer of driveline solutions in the world, which enables GKN Motorsport to offer an unsurpassed range of standard, lightened and easy motion constant velocity CV joints able to cope with the most demanding applications. On the back of over 30 years of continuous development of GKN Driveline products, GKN Motorsport plunging CV joints offer significant weight reduction (the lightweight joints offer around 20% weight reduction over the standard joint), cooler running temperatures, permit easy motion on both wheel and differential applications and enhanced joint life and performance. 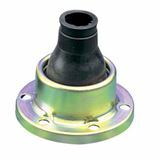 Plunging GKN CV joints are most often used as the inboard joint (transmission side) on FWD vehicles and on the inboard and outboard of RWD and AWD applications with independent suspension. The plunge on these joints is +/-8mm.